After the terrorist attacks on the United States of America by Al Qaeda terrorists on September 11, 2001 there were only three official federal law enforcement counter-terrorist teams in the United States: the original being the United States Marshal Service Special Operations Group formed in 1971 (an organization Jim Wagner has officially trained on numerous occasions out of the San Diego, Los Angeles, and Washington D.C. offices), the FBI Hostage Rescue Team founded in 1982 in preparation for the Los Angeles Olympic Games (Jim Wagner has not trained the HRT, but has trained a couple of their FBI regional SWAT teams, notably the Los Angeles and Phoenix offices), and the United States Federal Air Marshal Service created in 1968 (for which Jim Wagner was an Agent). Of course there were numerous federal Anti-Terrorist Task Forces around the country at the time as well as military counterterrorist teams, but federal military teams are legally not allowed to operate on American soil in a law enforcement capacity. After 9/11 the United States government believed that there was going to be many more attacks on American carriers and suicide bombings in American airports. The government was desperate for qualified active law enforcement or military personnel who were recently discharged. Initially the priority in the hiring process was to recruit anyone with special operations experience as was indicated on the original application form. Jim Wagner ranked as HIGHLY QUALIFIED and was selected for the U.S. Federal Air Marshal Service program under the authority of the Federal Aviation Administration (FAA). The Department of Homeland Security did not exist until a few months later on November 25, 2002. A day after the infamous attacks, September 12, 2001, Jim Wagner was a Reserve Sergeant for the Orange County Sheriff’s Department (Level 1 Reserve Designate with full police powers due to his Intermediate P.O.S.T. Certificate Municipal Police. This certificate is issued after the P.O.S.T. Basic Certificate only after 5 years of full-time police service, and only after accomplishing all Advanced Officer Training AOT). The Orange County Sheriff’s Department, the fifth largest at the time in the United States was had approximately 2,000 full-time deputies and 200 Reserve deputies. Sergeant Wagner’s position at that time was that of a Team Leader and instructor (bodyguard tactics, advances, and defensive tactics) for the Dignitary Protection Unit (a ten-man team) under Sergeant Wilfred Moreno and Captain John Hensley (Reserve). The day after the attacks Sergeant Wagner was assigned to the John Wayne Airport Sheriff Sub Station in Orange County California. 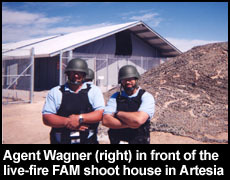 At the requested of the Incident Commander Sergeant Wagner gave a morning briefing to over 20 deputy sheriffs, the regional FBI, the Federal Aviation Administration, and airport authorities, because Sergeant Wagner had just returned from instructing and receiving training from the Israeli military and police on Arab terrorism. Sergeant Wagner also had extensive training with American and European anti and counterterrorist units. As such he was assigned as the supervisor of the main check point for all traffic coming into the airport. It was here that he and his deputies conducted field interviews and bomb searches of all vehicles coming into the airport. 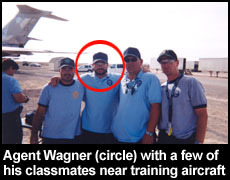 Sergeant Wagner was photographed by a reporter from the Orange County Register newspaper and he appeared on the front page on September 13, 2001 showing his direct involvement in the security of the United States directly following the attacks. While at the Sheriff’s Department Sergeant Wagner applied as a United States Air Marshal and was selected. He was sent to the William J. Hughes Technical Center in Atlantic City, New Jersey. At this location FAA instructors taught Jim Wagner and his group aviation security, how to handle and dispose of explosives on aircraft, and about world terrorist organizations. 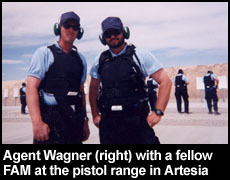 Jim Wagner was then sent to the Federal Law Enforcement Training Center Office of Artesia Operations FLETC, New Mexico where he was assigned to class A_TSATP-206B from March 14, 2002 to April 11, 2002. Phase One of the training was a new program for FLETC. Never before had the government trained so many people at one time in counterterrorism. The facility was literally training hundreds of agents every week. Most of the courses centered around live-fire firearms training (for qualification as well as domestic and foreign ground conflict scenarios), foreign weapons familiarization, terrorism case studies, and some mandatory federal law enforcement courses such as constitutional law, sexual harassment, and report writing. Jim Wagner qualified as an EXPERT on the Practical Pistol Course and he also received an Academic Award for having achieved an average score of 97.68 on all written examinations. It was because of this counterterrorism heavy curriculum that the FAMs (Federal Air Marshals) were not eligible to lateral transfer over to other federal agencies strictly on their FLETC training. A normal FLETC academy is good for multiple agencies. Next was a Transportation Security Administration Follow on Basic course from April 12, 2002 to April 17, 2002 with class A_TSAFB-216B. 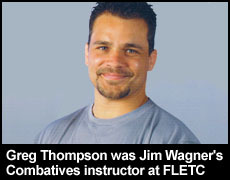 During Jim Wagner’s initial counterterrorism training at FLETC he had the good fortune to have Greg Thompson as one of his Combatives instructors. Greg Thompson was a black belt directly under Royce Gracie and a Level IV instructor in the Modern Army Combatives Program, and the creator of his own H2H (Hand to Hand Combat system), which he introduced into the FAM program. Greg Thompson said “at the program’s peak,” because after Jim Wagner’s class FLETC decided to cut the H2H training and go with mere basics. They justified the change because they wanted the Air Marshals to get the H2H training in the Field Offices, but that never materialized as intended. 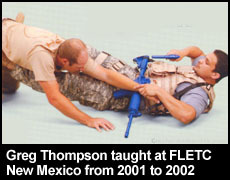 After FLETC Greg Thompson went on to write the book H2H published in 2006 and invented the Defenseband; a self-defense watch band used like a sleeve choke. 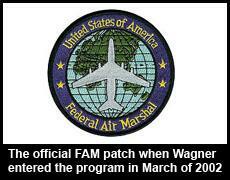 Phase Two of Jim Wagner’s training was the Federal Air Marshal training. This included live-fire shoot house training, Simunitions (FX) training in various aircraft and airport environments, hands-on surveillance courses that included exercises among the public in the city of Artesia, bomb searching and identification for both land and aircraft operations, armed and unarmed defensive tactics, team tactics, and updates on how the new Department of Homeland Security and newly revised U.S. Federal Air Marshal program would run (the program was taken out of the hands of the FAA and placed under a new authority). 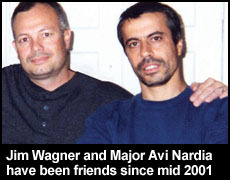 Agent Wagner was assigned to the FAM Los Angeles Field Office; one of the largest cities in America and one of Al Qaeda’s self proclaimed targets (eventually they did hit it while I was off duty that day when an Egyptian terrorist armed to the teeth ran up to the El Al airlines ticket counter and murdered a few people). The Los Angeles Field office proudly displayed the new FAM logo pinned up on a wall at the El Toro Marine Air Station with the words wrapped around it that read Operation Enduring Freedom. After only three days of filling out forms and learning how to do federal travel vouchers Agent Wagner and his team was out doing missions at the Los Angeles International Airport. The men and women on Jim Wagner’s team were well trained agents on the front line on the War on Terrorism ready to confront the nation’s enemies both domestically and internationally. The job of the early FAMs was not only to fly on American air carriers in teams to "neutralize" terrorist threats, but the job also included airport surveillance and finding weaknesses in the aviation security system. Al Qaeda was constantly testing the aviation system during the time that Jim Wagner was a Federal Air Marshal. 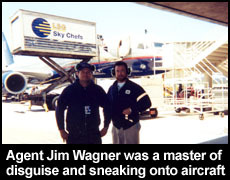 During Agent Wagner’s time at the Los Angeles office agents from the German Air Marshals approached Jim Wagner wanting advice on defensive tactics in aircraft for their new program. These were friends of Jim's when he had trained the tactics instructors of the GSG9 and then later on their own group at the Bundespolitzeischule (Federal Police Academy) in Lubeck before the global War on Terrorism had started. Just a year and a half earlier Jim had been flown to Germany to teach all of the federal academy instructors on the use of Simunitions (FX) and help establish their training program using the new system. Many of these were the same instructors who headed up the German Air Marshal program. On a hot summer day at the John Wayne Airport (SNA) one of Agent Wagner’s team members, Agent Shawn Black, phoned him up on his government cell phone just before a rendezvous for a mission and told him, "Jim, I am being followed by some Middle Eastern men. I believe they are terrorists. Do me a favor and set up a counter-surveillance when you come into the airport. I am at carousel 2. How many minutes before you are here?" Agents Wagner and Black did not want to “burn their cover,” so they had the Airport Police, the Orange County Sheriff's Department, respond to the terminal where the man in question was starting to exit the building – without any luggage. A female deputy sheriff arrived and made contact with the man Agent Wagner had kept under observation. Agent Wagner never did see the second suspect Agent Black spoke about. Unfortunately the female deputy had apparently never received any anti-terrorism training, for she spoke with the suspect for a mere thirty seconds, and then let the man go. The procedure was to bring the man, with sufficient back-up, into the sub station and let Agents Wagner and Black question him. 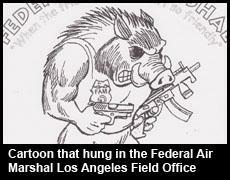 It was just one of many blunders that would happen between agencies in the early years proceeding 9/11. Also recalling that event at John Wayne Airport Agent Black stated, "Many of our past and current Federal Air Marshal Missions are still classified. 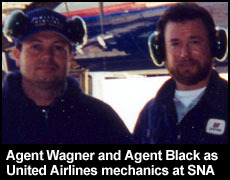 During several of our past missions I had the fortunate experience of serving with Agent Jim Wagner. While serving together on one particular domestic counterterrorism mission several years ago, our own team including Agent Jim Wagner, was under surveillance from Al Qaeda related associates. Agent Wagner's past experience and quick thinking as a former patrol and S.W.A.T. Officer proved instrumental in the continued success of the mission and the continued success of the Federal Air Marshal Service." A few years later Agent Shawn Black left the Federal Air Marshals and did two tours in Iraq. His last tour in 2008 was with the United States Department of State. After Agent Jim Wagner completed 146 Federal Air Marshal missions, suspicious activity started dying down in the aviation sector. At the same time Jim Wagner's monthly column HIGH RISK in Black Belt magazine, and his feature articles in Budo magazine in Europe in five different languages, were becoming increasingly popular. Since writing for these two publications, first in 1999 and then in 2000, the martial arts community was finally awakening to the real threats society was facing thanks to Jim Wagner’s reality-based techniques and training methods that are based upon military, police, and special operations training. 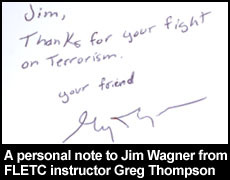 In conjunction with several other events happening at the time, Jim Wagner decided to resign from the federal government working his last day on September 11, 2003 - the one year anniversary of the terrorist attacks. "You can only tail so many people, fly back and forth so many times before it gets a little repetitive. Besides, the FAM higher-ups, now run by former Secret Service agents, were starting to put too many restrictions on the FAMS and officer safety was being compromised. It was no longer the elite team I had originally joined, so I left" Jim said. After Agent Jim Wagner completed 146 Federal Air Marshal missions Al Qaeda activity in the aviation transportation sector became rather quite, largely because passenger aircraft had become “hard targets” due to the new cockpit fortified doors, more Federal Air Marshals on flights, and Al Qaeda knew that passengers would tear them apart if they attempted another 9/11 style sky jacking. At the same time the FAM program was also experiencing mass quitting do to a lot of internal problems. Then, to Jim Wagner’s surprise, his Reality-Based Personal Protection articles in Black Belt magazine in North America, and his articles in Budo magazine in Europe printed in five languages, along with his recently released training videos on both continents, started becoming popular throughout the martial arts community. Other people were starting to define what "reality-based" was and was not, and Jim saw that many people were not fully grasping what Reality-Based was really all about. For all of these reasons combined Jim Wagner resigned from the federal government on September 11, 2002; the one year anniversary of 9/11. Had he stayed on with the program he was to have flown to New York City for a mission. Instead he spent his last day on an HSS International event up at the Burro Canyon Gun Range attending an Israeli firearms course taught by his good friend Major Avi Nardia of the Israel Defense Force (Reserve). A couple of months later, on January 21, 2003, Jim Wagner formed his own company and started the Jim Wagner Reality-Based Personal Protection system.